Why work to oppose only the “wrong” wars? Why not go after the whole enchilada? Why not oppose ALL wars? 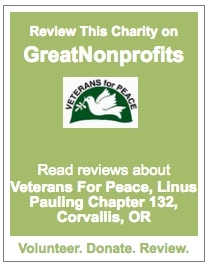 VFP Linus Pauling Chapter is proud to have joined a rapidly growing coalition called World Beyond War, due to roll out officially on the International Day of Peace, September 21, 2014. Our Corvallis VFP chapter has signed on for all of the supporting actions you will see at the World Beyond War website when you sign on, so we will be calling on our members and friends to fill support roles on this. No matter what your talents or interests…If you support peace, we’re certain we can find a valuable contribution for you to make. Here is some information from their website and a short video describing the situation. World Beyond War is a global nonviolent movement to fully end the institution of war and establish a just and sustainable peace. We’re officially launching on September 21, 2014, the International Day of Peace in the centennial of the war to end all wars. We believe the time as come to use peace to end all wars. To be posted here will be a surprisingly large, international, and diverse list of organizations and individuals. Thousands of people and groups have already signed the declaration of peace in dozens of countries. We’ll make the list public in good time. Please consider signing on too, if you haven’t already. Signing on is the way to get involved and help shape the planning of this movement before it is launched. To donate tax-deductibly through our fiscal sponsor until our own 501(c)3 exists: Make the check out to World Beyond War – NI. Send it to: Nonviolence International, 4000 Albemarle Street, NW, Suite 401, Washington, DC 20016, USA. Please watch this video and sign the pledge TODAY! This entry was posted in Foreign Policy, Human War Toll, Linus Pauling Chapter Actions, Peace Activism, War Economy and tagged International Day of Peace, linus pauling chapter, peace, VFP, war, World Beyond War. Bookmark the permalink.